I may bake all the time but I do actually try to maintain a healthy lifestyle, so I was quite excited when Chele of Chocolate Teapot set this month's We Should Cocoa Challenge, which is to bake something with chocolate that follows a healthy theme. 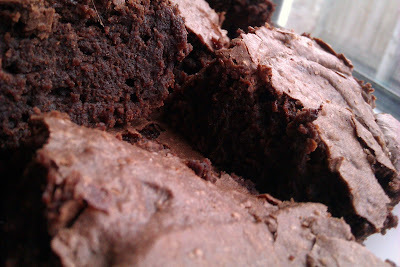 I'd long been considering making a healthier alternative to the gorgeous yet artery clogging chocolate brownies from Nigella's How To Be A Domestic Goddess (probably one of my favourite cook books). They are my favourite brownies by far and I always marvel at the difference between them and the consistently dry and crumbly shop variety. I can never understand why people in shops bake brownies like that; brownies should be gooey inside with a slightly crispy top and should ooze a chocolatey moreish quality (that may be something that I just made up, but brownies totally have it). Anyway, Nigella's brownies (without the walnuts) come to 296 calories per square - a combination of the 500g of sugar, 400g of chocolate and 400g butter, I suspect. That may not sound like a lot of calories to some of you, but when you think about a whole slice of cake being about 400 calories, a small square of one of Nigella's brownies looks pretty unhealthy. If you don't care what you eat, or want to treat yourself, I do encourage you to make the original recipe though because it is amazing! However, if you would like to try a healthier option, the brownies I made by altering Nigella's recipe came to 193 calories per square, so I've cut out 103 calories. Hooray! I did this by exchanging the butter for light mayonnaise (I got the idea for this from a recipe on the BBC's Good Food site), halving the chocolate and replacing it with cocoa powder and halving the number of eggs because as far as I can tell you don't need that many eggs in a cake, and I know that they are being partly replaced by the egg in the mayonnaise (though I'm not sure the mayonnaise would help with the combining things together, as is the egg's role in baking). I did consider using sweetener instead of sugar, but a bit of research showed that sweetener doesn't really do a lot to the calorie count. 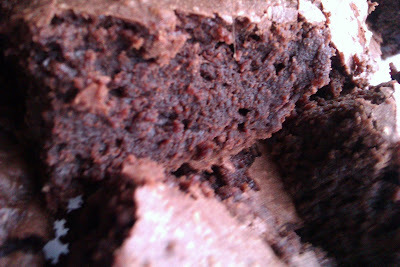 Overall, then, these brownies are lighter on the fat and cholesterol count as well as calories - not bad. Don't be taken in by the popular idea that low fat or healthy food doesn't taste as good as the real thing. 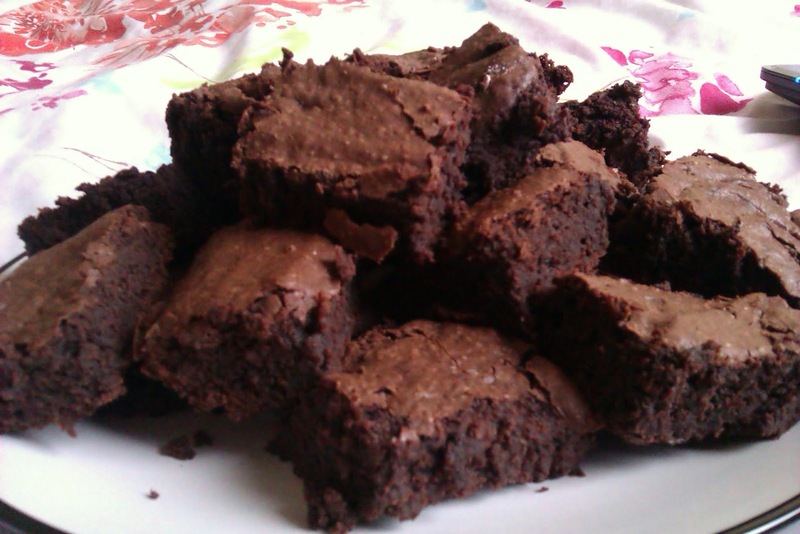 These brownies taste very, very good, and are just as gooey and tasty as the original. They could probably do with slightly more of a chocolate flavour, but that might be because I used Morrisons value chocolate and not the fancy stuff because I'm a student and can't afford fancy anything. These are so good that I had to have a second helping. If you want more proof, make them yourself! 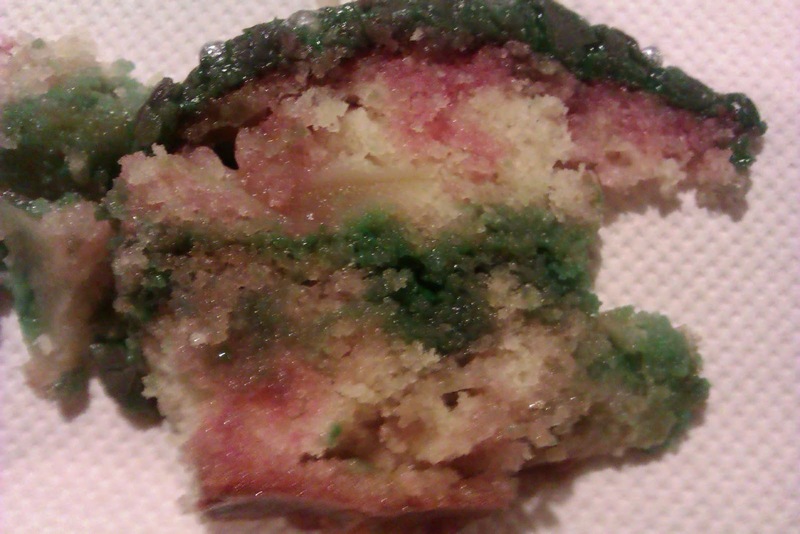 Dr Oetker, what kind of terrible food colouring have you made?! Preheat the oven to 180C and line a brownie tin if you have one - if not, use a roasting tin (like me) or similar deep-dish tin. 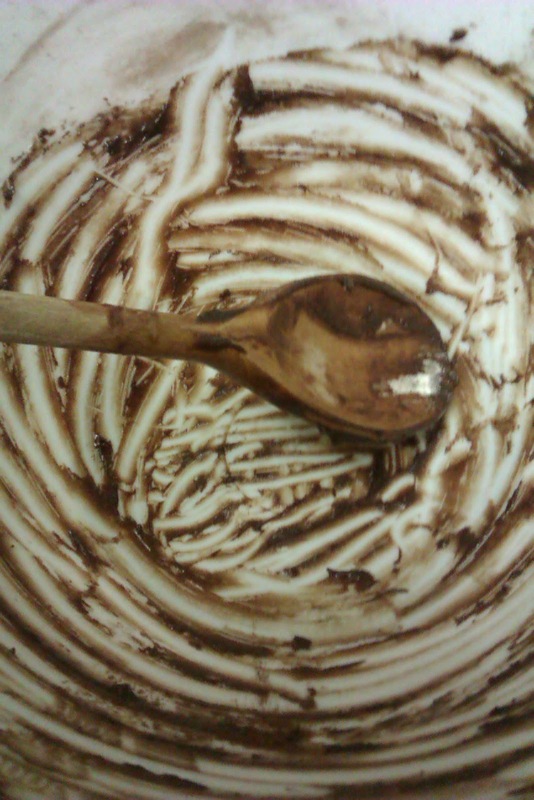 Melt the chocolate in a pan over a low heat, then stir in the mayonnaise. Don't be alarmed by the odd consistency that it forms; it'll sort itself out later. The mayonnaise and chocolate mixture. Take the pan off the heat and stir in the sugar in small amounts at a time. Add the eggs to the mixture. They are easier to stir in if you break the yolks first by stabbing them with the spoon. 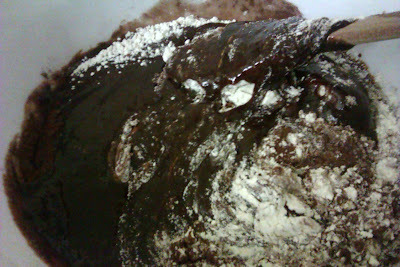 Put the flour and cocoa in a bowl and fold the chocolate mixture into it. Make sure you scrape the bottom to get any illusive flour. 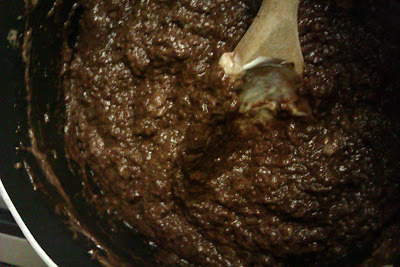 Pour the mixture into your tin and bake in the oven for about 20 minutes before checking it. Your mixture should be just cooked in the middle and a lighter brown on top. Use a skewer to check how cooked it is; if it needs longer (it probably will), check it every five minutes to make sure that it doesn't overcook and become dry. Remember that the brownie mix will continue to cook when it is taken out of the oven until it cools, so when ready to be removed from the oven the skewer won't come out completely clean but the mixture on it will be sticky and not runny. Of course I had to lick the spoon! When the brownies are done, remove them from the oven and leave to cool before slicing up and serving. Nigella's recipe uses 180g chopped walnuts; if you wish to use them in your recipe stir them in just before you pour the mixture into the tin. If there are any terms that you didn't understand in the recipe, please visit The Basics. and if you're a fan of the blog and want to know when I post a new recipe, feel free to like Cake Of The Week on Facebook! Your brownies look just as a brownie should and you described that very aptly. I've tried mayonnaise in a chocolate cake before and it worked well. I've been meaning to try it in brownies too so this serves as a good reminder. Thanks for entering WSC.